Punto Antico - Bruna Gubbini's Seventh Book! This is the fourth (and final) part of a series written by Silvana Vannini of Italy and translated into English by myself. 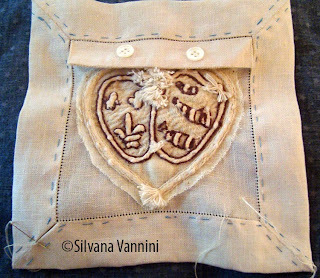 This is the second part of Silvana Vannini's Trapunto project. For materials, the pattern and stitching instructions, please see the project first part. This second and final part of the instructions for the project will cover the finishing. Pillow Flange: Fold in from the edge to match up with the withdrawn thread outline around the centre part with the Trapunto and baste. 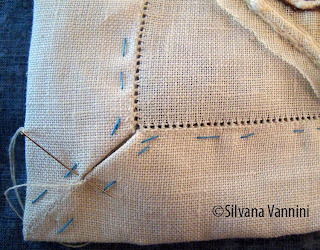 Whipstitch the corner seams closed. 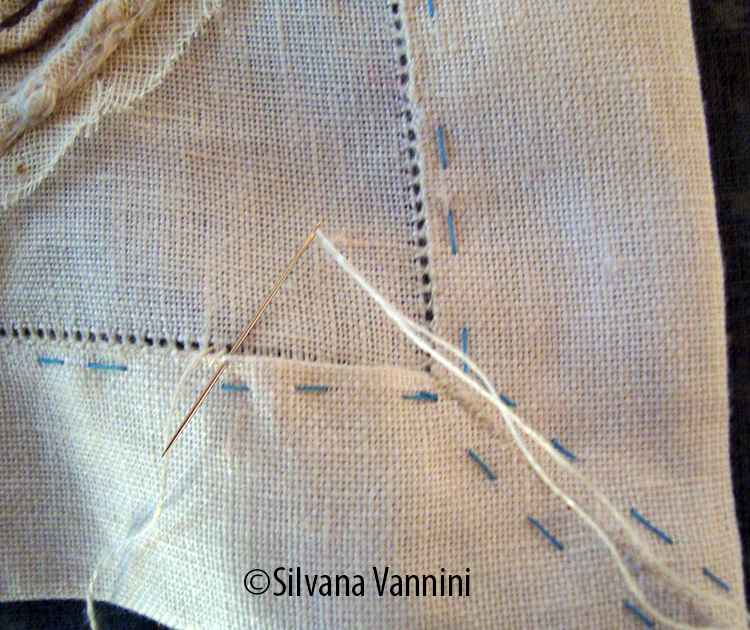 Execute the simple hemstitch to secure the flange and remove basting threads. Button flap: Sew the two pieces together with a seam allowance of 1 cm, leaving an opening of about 2.5 cm on one of the long sides in order to turn the piece right-side out. Turn right-side-out, using an awl into the corners if necessary to make a small rectangular piece which should measure 10 cm by 2 cm. Whipstitch the hole closed. Attach the two buttons. 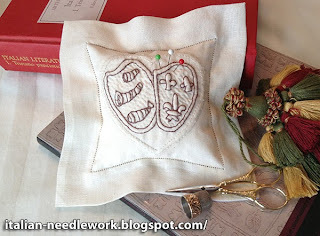 Attach the button flap to the embroidered piece on three sides with the simple hemstitch. 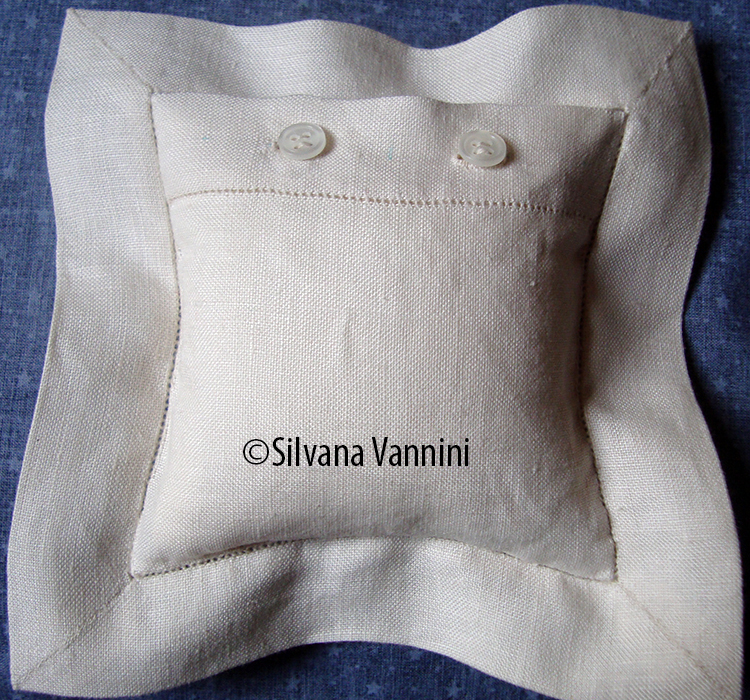 Square back piece: On one edge of the square, measure down 5 cm in from the edge and remove one ground fabric thread, leaving the ends free at 1 cm in from either edge to be buried later inside the pincushion. Fold the edge in on all four sides 1 cm and baste. Fold over the side with the withdrawn thread to line the edge up with the withdrawn thread, baste. Using the simple hemstitch, attach the 2 cm hem at the withdrawn thread. Press. Remove basting thread. 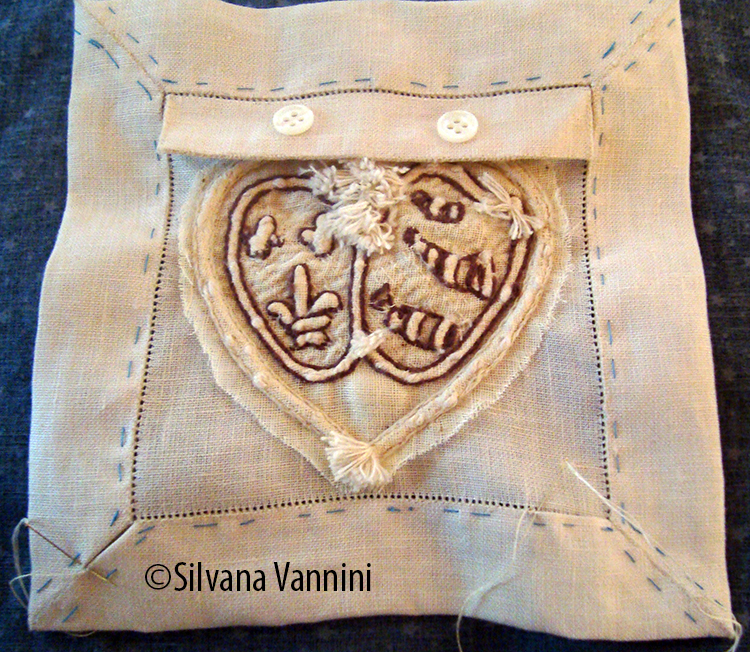 Line up this piece with the button flap on the embroidered piece and double check that the buttonhole positions line up with the buttons. 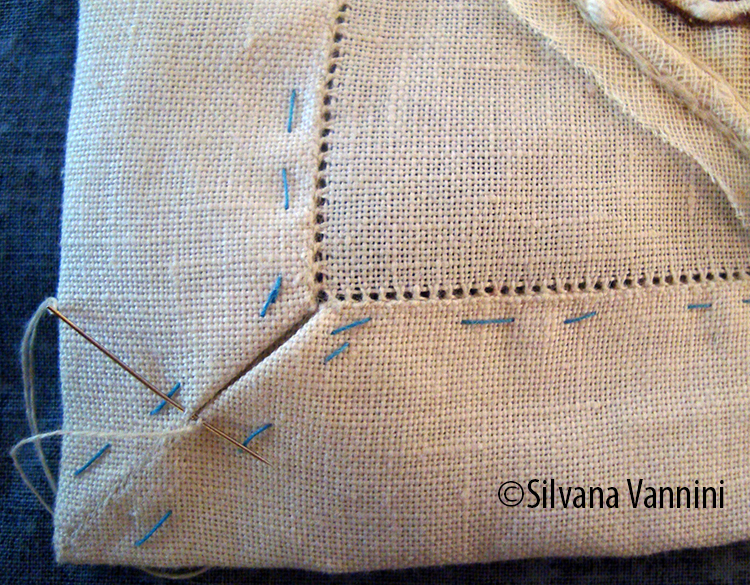 Create buttonholes using the tailored buttonhole stitch and carefully cut the centres. Using the simple hemstitch, attach this piece to the edge of the hemstitching of the embroidered piece on three sides, the edge with the buttonholes lines up with the button flap. Stuffed cushion: Sew the two pieces together with a seam allowance of 1 cm, leaving an opening of about 2.5 cm on one side. Turn right-side-out, using an awl into the corners if necessary to make a small square cushion. Press. Insert cotton quilt batting into cushion and whipstitch the opening closed. Place inside the embroidered pincushion and use the buttons to close the back. I hope you have enjoyed this series on Trapunto and the Guicciardini Coverlet by Silvana Vannini, don't forget to pop in and see her reproduction Trapunto coverlet at the Palazzo Davanzati when you are in Florence! My deepest thanks to Signora Vannini for sharing this incredible experience with us!